Many providers claim this but we live it: we treat our clients as our family. Because we spend so much time out in the community, the professionals at Emerald Elite are held to a higher standard than other providers — ours. Emerald Elite’s nurses, certified nurse assistants (CNAs) and companions are there when you or a loved one faces a challenge. We offer a full range of home care services — medical home health care and various non-medical services — aimed at providing assistance, peace of mind, comfort, and companionship. Importantly, our LGBT caregivers understand the special needs of our clients in a way other providers don’t, so we’re able to offer individual and customized service, whether that’s on an as-needed basis or 24/7. We carefully match our caregivers with our clients, because comfort and trust are paramount. You may be recovering from surgery, in the midst of a major illness, or just needing help doing those things around the house that are tougher to do now. Or you may be facing more complicated circumstances that have altered your daily living. In either case, Emerald Elite Home Care can help you get through your day with less stress — on your body and your mind. If you’re not certain Emerald Elite is right for you, or you’re not even sure home care is right for you, we say: Give us a try. Start small, and see how helpful and comforting our home health aides are. Easing into outside help can be overwhelming for some clients, but we think you’ll soon love the convenience and service we provide. And starting small may avoid an emotion-filled discussion down the road. We’ve all said it: “There’s no place like home.” Those familiar and comfortable surroundings have a positive impact on your outlook, and Emerald Elite’s comprehensive in-home senior care services are aimed at keeping you at home as long as possible. We provide wide range of services, from light housekeeping or a trip to the grocery store to Alzheimer’s, dementia, or geriatric care. Keeping South Florida’s LGBT seniors safe and well-cared for is our goal. Our skilled staff includes nurses, nurse assistants, and companions available as much as you need us, to assist with day-to-day activities such as getting to appointments, medication management, bathing, or meals. Our LGBT senior home care professionals are trained to provide top-notch care to the elderly and infirm, never forgetting to show the kindness and respect they deserve. 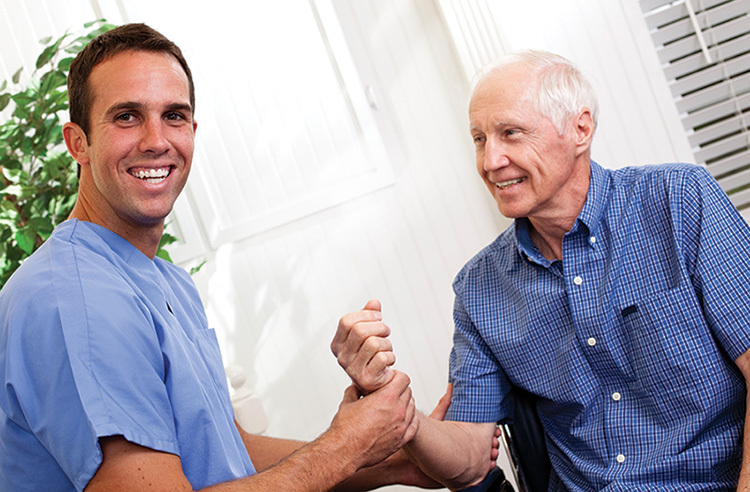 At Emerald Elite Senior Home Care, we take our work, our clients, and your health seriously. Emerald Elite is the only licensed home health care provider in Wilton Manors and our quality assurance profile matches our words. Your care is reviewed continually and approved quarterly with reassessment visits performed by registered nurses. We also perform random visits on our LGBT caregivers at the worksite. All our caregivers carry liability insurance, have had a five-year background check conducted by the FBI, and have been pre-approved to be hired by the State of Florida. WANT TO WORK AT EMERALD ELITE? CLICK HERE!